PVC style fences have enjoyed booming demand over the last decade and are some of our most popular choices with good reason. They are virtually maintenance free, come with a limited lifetime warranty and are a green product that is recyclable. PVC can offer complete privacy but is also available in several styles and colors. Although there is flex to PVC, it has five times the tensile strength of wood. Our manufacturer uses only pure raw materials made in the USA in making the products. By far the most popular style is our 6′ high white total privacy fence called Tongue and Groove. It was created to be the privacy fence that would stay looking the same for many years and require no maintenance. Other available styles include lattice and stake top tongue and groove, PVC vertical shadow box, picket fence and horse rail fencing. All styles are available in a tan color and a darker tan called Khaki. Colors can also be mixed within one fence. Grained texture pickets are also available. Some find it hard to understand how a material as flexible as PVC is can be strong. If one grasps the top of a 6′ high privacy PVC fence, it can be swayed back and forth. In fact, PVC has four times the flexibility of wood but it has five times the tensile strength. 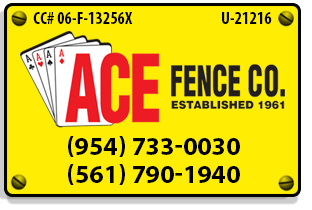 It, and every fence Ace installs, will meet or exceed the strict wind load requirements in our counties. Vinyl is virtually maintenance free. It is smooth and non-porous which makes it difficult for mildew to grow. It will form in only under the wettest conditions but is easily removed with water and a mild detergent as is any dirt which may accumulate on the fence. There is no need to scrape, paint or stain a vinyl fence. When PVC was new, its cost was more than double that of wood fencing. Some people think they can’t afford a vinyl fence because that is what they have heard. The pricing has come down significantly. Additionally, our quantity purchasing and in house routing makes our prices highly competitive. We use only welded PVC gates. They are never screwed or riveted. We use only stainless steel hardware so they will not rust. In every hinge post that carries the weight of a gate we put an aluminum insert for added strength and to secure the attached hardware. The gate is the only part of the fence that will move. It needs to be the best that it can be and the best is what we provide. These are more ACE Peace of Mind features. We do not sell or install the PVC fencing that some have seen at the home centers. They use 4″x 4″ posts. We use 5″x 5″ posts which are also thicker. Our fences have rails that are held together through routed holes directly in the posts. Their fences need metal clips to hold the fence together. Their fence needs a wood post inserted into each PVC post in an effort to make them strong enough to meet local codes. The added cost of the wood posts and metal clips make their total post cost higher than our posts which meet all codes in and of themselves. Simply put, our PVC is thicker, stronger and better looking.